It’s THAT time of year. We’re all obsessed with tropical beach fantasies. Palm trees and sandy beaches. Beautiful sunsets over a tranquil shore. Some people will be lucky enough to get away for a beach vacation. But not everyone. Well… Wallpapers for Windows has made it easier than ever to bring the beach to you. 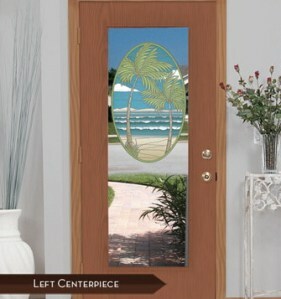 We have several new patterns that will transform any room in your home or office into a tranquil island oasis. 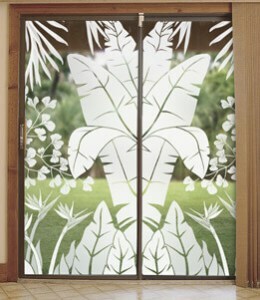 Shown here (right and below) is our Tropical Oasis Etched Glass window film. 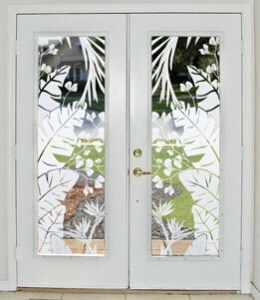 This design is available in a variety of sizes (in left and right patterns) to accommodate all kinds of windows and doors. 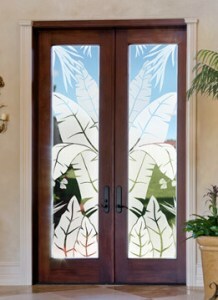 It works beautifully on both sliding glass doors (and tall sliding glass doors), french doors (and tall french doors), entry doors, storm doors, large windows and side lights. 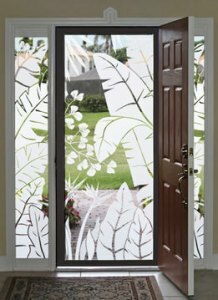 These adhesive-free films instantly transform any space, without obstructing the view. And they’re not just pretty. As with all of our designer films, they will filter 95% of the UV rays coming into your home to protect carpets and furnishings from fading. 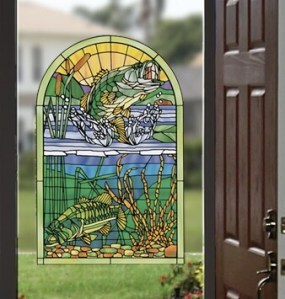 This entry was posted by Design Team on July 19, 2012 at 12:54 pm, and is filed under Decorate Glass Doors, Decorate Windows, Glass Storm Doors, In The News, Sidelights, Sliding Glass Doors, Window Film Basics. Follow any responses to this post through RSS 2.0.Both comments and pings are currently closed.